This is your Maine getaway, the one you have been searching for! Perfect for the couple who want to experience the coast of Maine from the water's edge and not a cramped hotel room. The cottage sits on a large lot with its larger 2 bedroom sister cottage 'Lofty' (VRBO# 165589) about 200 feet away. Rent one or if you prefer rent both and have the grounds and dock all to yourself...sort of your own family vacation compound. Water views from every room. Located on a dead end gravel road typical of Harpswell, a mix of local color, cottages and fisherman. 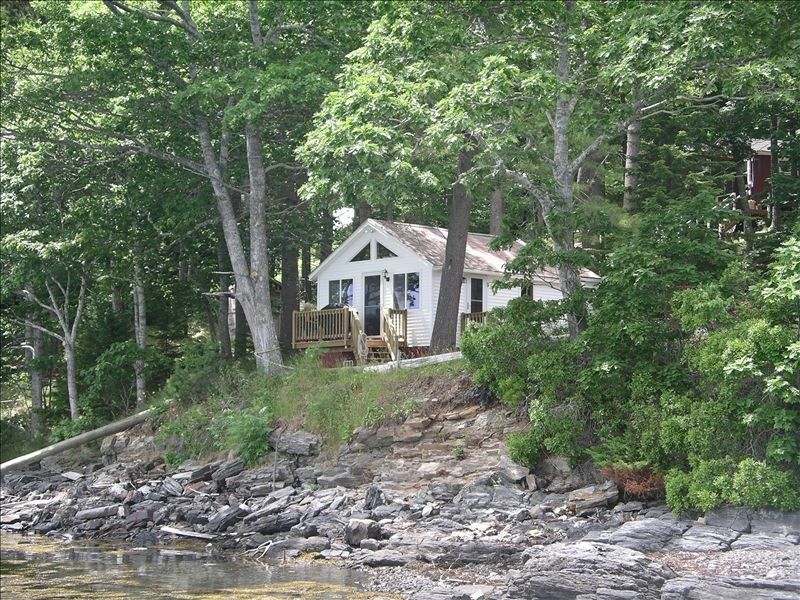 This cute one bedroom cottage is perfect for relaxing on the ocean and enjoying the outdoors. Private yet only minutes from downtown Brunswick including Bowdoin College, the Maine State Music Theater, restaurants and shops. Fully renovated in 2007 and further updated 2017 this cottage features a knotty pine interior, new appliances and a full bath with large shower. In response to guest feedback we have added additional kitchen storage and work space. The bedroom was also redecorated! Private fire pit for marshmallows and relaxing. The cottage has a comfy knotty pine living room with cathedral ceiling that opens into a small deck just feet from the waters edge. Enjoy your morning coffee or evening drink as you watch the ospreys dive and the seals swim. The living room has a small color TV with DVD player for leisure time as well as mini stereo with mp3 player plug in capability. The kitchen is fully equipped with all the necessities including a big lobster pot. If you like hikes and are looking for a wonderful one, Karen and I recommend Morse Mountain Preserve owned by Bates College in Phippsburg.. It's a 4 mile loop that leads to Seawall Beach, the views are incredible and the hike is doable even with kids. For more information see the link below. Attention Boaters....there is a mooring available that will handle up to a 30' boat, if you need to arrive by boat or moor at the house for the week. We are getting many inquiries from sailors who want to arrive by boat. The mooring and dock are available with prior arrangements and a small additional fee for use of the mooring. Cozy is the perfect place for a quiet retreat. Compared to a hotel this is a wonderful value and a great way to experience the coast of Maine. To get a bird's eye view use google earth. Just click on the 'See All My Rental Listings'. Please e mail us with any specific questions about any of our listings. Renting a private home is different than staying at a hotel. It is important to ask questions before you reserve and to have realistic expectations. We have done our best to describe our properties, however, guest expectations vary. If you have special requests or needs please ask before you reserve. We want to avoid renter's remorse or the old "this was not what I thought it was going to be like". In most cases guests never asked any questions!!!! Refunds at the time of check in are not permitted. PS. Ask about our long term rentals...maybe stay the summer! Cozy is a comfy spot to rest and enjoy the Maine coast. Harpswell is a wonderful place to use as home base and explore the Maine coast from Portland to Boothbay. Views, dock, fire pit, grill, quiet, that Oh so close to the ocean feel. Quahog bay and lobster traps at your arm's reach. Linens/towels provided for an additional 35$ or just bring your own. With Aux MP3 plug in. Faces the ocean and suitable for dinner for two! Cozy is aptly named, as it was cozy and comfortable. It was the perfect space for a quiet getaway. It's location is lovely, and the view of the water was just what I was hoping for. The kitchen was well stocked with tools, the furnishings were just right and the bed was great. Although there were other houses nearby, the trees and water made the cottage feel solitary, and listening to the boats and the birds on the water was peaceful. I would stay here again without a second thought. A beautiful setting and definitely a cozy little cabin. We did a lot of sightseeing in the midcoastal area. It reminds me of Puget Sound back home where I grew up. We loved the Maritime Museum and Down East to Acadia National Park. Everything was wonderful. A couple things you should know...there is no washer and dryer in Cozy so couldn't wash linens as stated to get refund. No lobster tools to crack them to go with lobster pot provided so we improvise. No gear for fishing poles and no lobster trap at dock. This place is truly a gem all in all. I highly recommend it to anyone looking for seclusion, peaceful sleep, and located close to islands. My husband said it was all he wanted in a place to stay for our return to Maine. My husband and I really enjoyed our stay at Cozy. We did some local hiking. Bought local seafood to cook back at the cabin each night. We brought our tandem sea kayak and launched it off the deep water dock for a couple of paddles around the many islands in the bay. Enjoyed Freeport and the many shops. Went for a beer tasting at Flight Deck, the nearby brewery. The fire pit was a bonus and we had a starlit night to enjoy it. We would not mind returning to Cozy some time in the future. Perfect setting for a relaxing getaway! My husband, our little Boston mix, and I loved our stay at Cozy so much! We especially enjoyed waking up every morning to the gentle sounds of water from the bay lapping against the rocks and land and enjoying our coffee on the deck. The cabin is located perfectly off the beaten path, but close enough to larger towns in order to grab some fantastic Maine seafood and do some shopping. We kept talking about wanting to come back again in the future and continue exploring more of the area. There is just so much to see that you can’t cover it all in one trip! Thank you for a wonderful stay! It was just what we needed. Lovely, quiet, water's edge cottage. This was a great place for simple, summer living. The kitchen, while basic, was perfectly adequate, as was the bathroom (plenty of hot water with good pressure). The bedroom, cozy indeed, had a very comfortable queen bed. We usually awaken early and it was a real pleasure to wake up to dawn's arrival and the low rumbling of fishing boats headed out in the early hours. Making coffee and sitting on the deck to enjoy the sun peeking over the opposite tree line. Watching the water rise as it began to cover the cormorant encrusted ledges, listening to the gentle lapping of the waves and simply enjoying the feel and smell of the air completed our routine. Then we were off, early if we expected to arrive at Wiscasset Village Antiques at nine on the way to our other favorite antique stores in Wiscasset. After a picnic lunch of brie, hard sausage, French bread and fruit, we made our way to Popham beach to enjoy walking at water's edge and out to the island. Other days, a visit to Bowdoin's excellent museums, further antiquing and shopping, a cup of coffee, or to Bath to the Maritime Museum with a side trip to Markings Gallery, would fill our day before we returned to "Cozy" for supper or to freshen up before heading out again to dine at one of many excellent options. Freeport is close as is the Boothbay Botanical Center. All of which is to say in a long-winded way, "Cozy" is ideally located for just about anything you would like to do in the midcoast. Of course, I have not even mentioned how easy it is to fish, motor boat, kayak, or whatever else your trip to Maine must include. Thank you so much for your kind review. Sounds like you had a fun filled week of activities! There is so much to do in the Midcoast region,we wish we had more time for exploring. We greatly appreciate our guests and are so glad you had a good stay. We hope you can return again in the future! Sebascodegan (Great Island), Orr’s, and Bailey, which are connected by bridges, the most notable being The Cribstone Bridge, and a scattering of over 200 smaller islands accessible only by boat. With some of the few remaining working harbors on the Maine coast, it offers an authenticity of which we are proud.